Finished in a stylish black matte coating, this Black Matte Boston Cocktail Shaker Tin is the perfect alternative to a traditional Boston Glass. 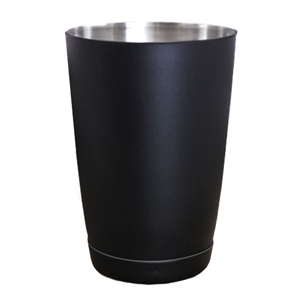 When used in conjuction with a 28oz Boston Cocktail Shaker Tin, this Black Matte Boston Cocktail Shaker Tin will create the perfect cocktail every time. As well as using it to shake cocktails, this Black Matte Boston Cocktail Shaker Tin is a unique and interesting way to serve cocktails; simple shake them up and serve straight away.